Most of life’s greatest memories involve friends and family gathering around food. Potluck dinners provide the perfect opportunity to (literally) bring everyone’s talent to the table. Coordinating a large group can take a little extra work, so think ahead with these tips and ideas. A little organization and planning can go a long way to make your next potluck a huge success. Provide Guidelines - Offer serving size information in advance. Potluck portions don’t have to be exact, but let guests know if you are expecting their dish to serve 10 or 30 people. Consider Resources - If you are hosting or organizing a potluck outside of your home, make sure you understand essential logistics including available oven space, electrical outlets, water availability, number of tables, chairs, bathrooms and trash cans. Remember the Essentials - In addition to plates, cutlery, napkins and cups, remember extra serving utensils and potholders for hot dishes. Don’t forget plenty of extra dishcloths and paper towels for spills. Don’t Forget the Drinks - Providing a small drink station is often the host’s responsibility, but if you want to make it more elaborate ask for guests to sign up to bring a drink. 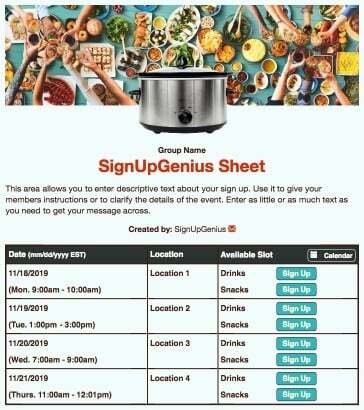 Sign Ups are Crucial - Leaving the potluck menu entirely up to chance can be a recipe for disaster. Make sure you have enough food for each portion of the meal including salads, appetizers, entrees, sides and of course, dessert. 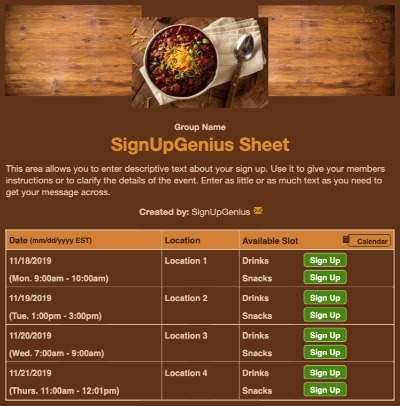 Genius Tip: Create an online sign up to make potluck planning a breeze. Presentation Matters - Tablecloths, even the colorful, inexpensive plastic versions, make a noticeable difference. Plan for simple centerpieces such as candles, fresh flowers or fruit from the garden. Ask for Recipes - These can be especially helpful for guests who have food allergies and make for great conversation starters. Send Reminders - Make sure all guests remember what they signed up for, including food drop-off times. Genius Tip: Send custom reminders to potluck chefs a few days in advance with instructions on where to drop off their food, suggestions on how to package and transport their dish, etc. It’s never fun to wait in line only to arrive at a table with no more entrees and a sloppy view of what once was. Organize by Category - Be sure guests know what is ahead and suggest limits if needed (like two salad choices per person). Without order in your food placement (such as salads, appetizers, main dishes, sides and desserts), guests will grab unlimited amounts of food and you may run out. Make sure you have enough on hand to feed everyone! 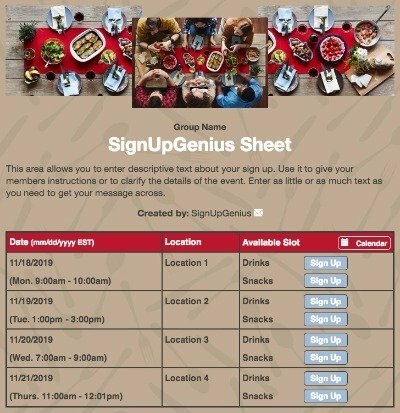 Develop a Serving System - Come up with novel ways to call guests to the serving line, such as everyone with a birthday in September or all employees with kids in elementary school — anything that reduces the number of people in line at one time. Replenish When Needed - Assign volunteers to remove and replace items as soon as they run out. The sight of sticky leftover crumbs and food residue is rarely appealing. Provide Signs - Have signs available for guests to list the name of their dish when they arrive. Brightly colored cardstock cut in half and folded works well. Also provide signs for plates containing a common food allergen, such as nuts or gluten. Offer Exclusive Tables - Depending on your group, consider providing tables for specific food needs, such as a gluten-free or dairy-free table. A separate kids-only table stocked with kid-friendly options can save the day! Avoid the extra time and scrambling at the end of dinner with a little prep work and a group of reliable volunteers. Purchase Disposable Containers and Foil - Or ask guests in advance to bring their own. It will mean less waste and cleanup will be faster. Create Memorable Folders or Envelopes for Recipes - These make a great parting gift to remember of all the potluck fun. Be sure to ask guests to provide copies of their recipes in advance and decorate them before the event. Not only can a theme make your potluck more exciting and encourage ideas for decor, but it also helps guests decide on the most appropriate dish to bring. Just Like Home - Ask guests to honor the flavors of their home state with their favorites such as Texas BBQ, Louisiana Cajun or New England chowder. Seasonal Favorites - No need to limit the actual season — sometimes Christmas dinner in July is just what your group needs. Genius Tip: Check out these Christmas potluck recipes. Breakfast for Dinner - Some call it “Brinner,” but by any name, it’s delicious. According to nutritionists, eggs are one of the healthiest foods on the planet, low in calories and high in protein and nutrients. Picnic Night - Gather all your favorite foods (s’mores anyone? ), red and white checkered tablecloths, juicy watermelon and zero ants. Genius Tip: Plan a church picnic with these tips and tricks. Crockpot Crazy - Most busy families are looking for a few new slow cooker ideas. Be sure to check your outlets and extension cord availability, then go crockpot crazy! Inspired by Travel - Ask guests to bring a dish inspired by something they love from a treasured trip abroad (vacay photos are optional). Movie Meals - Get creative and base your theme on favorite movies. See what your guests create with themes such as American Pie, The Breakfast Club or Blended. Genius Tip: For family-friendly events, take a look at these classic movies. Make Your Own Pizza - Host a competition for the most original pizza creation — dessert pizzas included. By the Sea - Think fresh seafood dishes plus anything with a marine theme (zucchini boats, submarine sandwiches). Pasta Night - There are so many dishes and styles of food to go with this theme. Be sure to add some gluten-free options to the mix. Gameday Fanfare - Cheer while enjoying your favorite tailgating foods. Genius Tip: Get your head in the game with these simple tailgate food ideas. Tapas - Traditional Spanish tapas are always a party hit! Party planners suggest preparing 6-8 tapas per guest, with a variety of cold and warm options. Comfort Favorites - Ask guests to bring their most beloved comfort foods along with the scrumptious stories behind them. Food on a Stick - Reduce your need for utensils and let guests get creative with all sorts of combinations, from grilled veggie skewers to corn dogs and fun fondues. Set some ground rules so the kids don’t use the sticks as weapons! Veg Out - Lighter vegetarian meals are extra fabulous for the hot summer months. It’s always wise to include a few kid-friendly staples with this one. Soup and Salad Supper - This classic duo is especially appealing for cold winter evenings. Keep it simple and discover fresh meal planning ideas by collecting everyone’s recipes. Appetizers and Desserts - These courses never fail to provide perfect party eats. Keto Night - Low-carb and low-calorie meals simply taste better with friends. Find new favorites to share. Finger Foods - This theme works exceptionally well if you’re concerned about a lack of seating or utensils. Build Your Own - Pick one or even a variety of DIY meals — creative and hearty fillings for baked potatoes, burgers with all the toppings, build-your-own sandwiches, pizza and more. Ice cream sundaes, complete with every yummy topping imaginable, provide a satisfying finish. After a little prep and planning, sit back and experience how a successful potluck blends a melting pot of people, styles and delicious flavors. Organize a booster club BBQ fundraiser with a sign up.